Congratulations to the 2012 Employer Excellence Award Recipients! 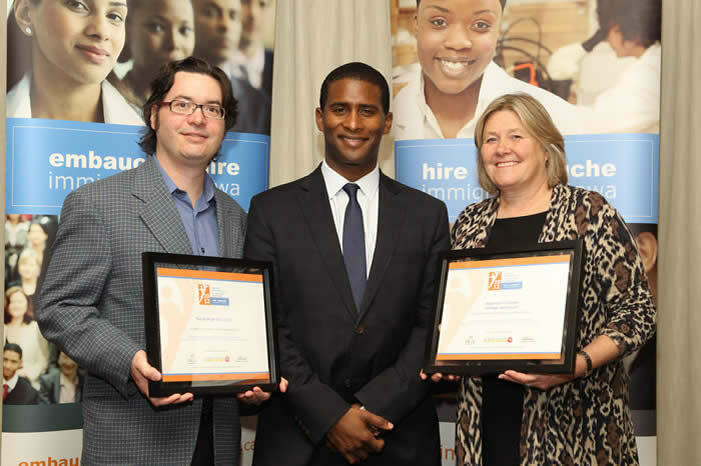 The following Ottawa employers were recognized at the 2012 Employer Council of Champions Summit for their outstanding practices in the retention of skilled immigrants in their workplaces. From left: Paul Vallee, Pythian; Adrian Harewood, CBC; and Denyce Diakun, Algonquin College. A remote database and consulting services company, Pythian supports the inclusion and retention of skilled immigrants into its organizations through innovative policies, programs and strategies. By employing a collaborative, transparent hiring process that involves human resources and technical hiring managers, Pythian ensures that it attracts highly qualified candidates — no matter in which country they have gained their expertise and experience. “Many of our hiring managers are internationally trained professionals themselves, so they always lead by example,” says Heidi Hauver, Director, Human Resources. 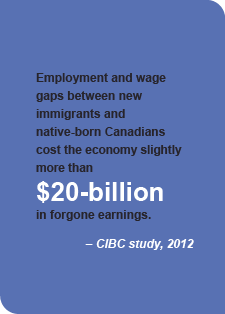 Such a collaborative approach not only effectively eliminates biases and systemic discrimination, but has also attracted top global talent, with over 30 per cent of its Ottawa-based employees alone coming from outside Canada. Once hired, new employees go through the same structured orientation program, and are matched with a buddy to ensure they successfully integrate into the workplace culture. A self-directed professional development budget is allocated to all employees so that they may further their career development — and therefore be successful within the organization. Lunch and learns and training sessions augment this program. In addition, whenever possible, qualified employees are promoted to new or vacated positions if the employee is the most qualified applicant. For the past 20 years, Algonquin College of Applied Arts and Technology has adopted various programs to attract, retain and engage skilled immigrants. One such program, the Algonquin College Access Project, which was designed to provide educational opportunities to employees to help them advance in their careers at Algonquin, has evolved to become the Workforce and Personal Development stakeholder group. Algonquin works with a number of stakeholders in the Ottawa area to develop programs and projects that will help further education and employment opportunities for skilled immigrants who work at the college. 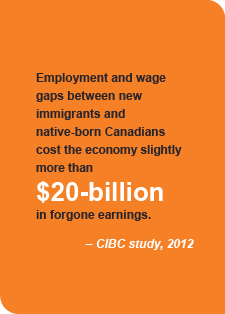 Programs include mentoring and advisory services designed to meet the specific needs of skilled immigrant employees. As well, human resources and other front-line staff, faculty, counsellors, advisors and recruiters are trained in cultural competency — considered a ‘best practice’ to ensure the retention of skilled immigrants.